When it comes to stain removal for your commercial or residential carpet, there are easy tasks and not so easy tasks. Some can be done yourself if tackled immediately whereas others will be left to carpet cleaning professionals. Red wine is one of those difficult stains. Here is some need-to-know information about red wine stains. Wine is one stain that is extremely tough to remove; it is by far one of the toughest. 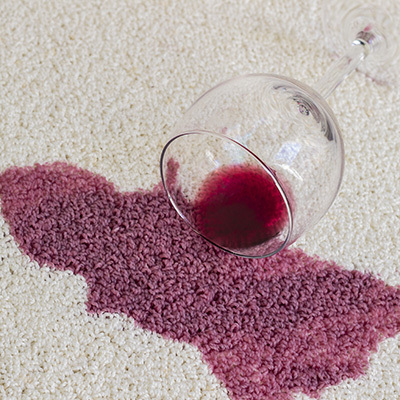 You have a much better chance at getting wine out of your carpet when the wine is first spilled, especially red wine. Red wine has to be tackled immediately. If it is allowed to dry completely it will be almost impossible to get the stain out by just simply cleaning it without pre-treating it. This type of stain has to be taken care of as soon as it happens or you will be forced to cover the area up with either a piece of furniture or with a rug. If not that, you will probably have to get professional help done. Removing a red wine stain from your carpet, rug, or upholstery is a very meticulous task. You must saturate the stain thoroughly with club soda. Once the area has been saturated with club soda then you must blot it. It is imperative that you do not rub or smear the stain with a rag because doing so will make the stain worse. It will actually increase the size of the stain. Something the size of a quarter can be magnified to the size of a soccer ball if you rub or smear the area. If the stain is smeared and becomes bigger the situation is out of control and it is time to rethink attempting to get the stain up if that occurs. If you see that the stain is fading away each time you repeat the process then you are succeeding in removing the stain. Carpet cleaning and removing tough stains is very time consuming and hard to do. It will also test your patience, but once you have figured out how to deal with them the next time you’ll be well prepared.